Print Director now supports Google Cloud Print integration. This allows users to print from their mobile devices or Chrome OS workstations/laptops. Their print jobs will appear in the normal Print Director Follow Me system and can be released at the printer as normal (PIN or card swipe). Print server will need Chrome web browser to be installed. The Google Cloud Print Service must be installed on the print server. The users will need to have Google Account email addresses (e.g. johnsmith@gmail.com). If your organisation’s email is hosted with Google then they only need their work email. Unless your organisation already has an admin Google Account from which to share Cloud Printers, you will need to create one. In the top right, click Sign in. The next window will ask you to choose an account. Click Add account. In the next window, click Create account. Fill in the details for your organisation’s Google Account. Keep the email address and password in a safe place. Before we download and install the Google Cloud Print Service for Windows, we need to create a user account on the server under which the service will run. We will then set this user as the Cloud Print user in Print Director. Create a local user (or a domain user) on the server (e.g. CloudPrintUser). Note that if the user is a local user it won’t have access to domain resources (e.g. connections to shared printers on other servers). If all the printers are local printers, a local user will be sufficient. Ensure that the new user’s password never expires. In Resource Manager navigate to User Management > Users. Choose the Department to which the user will be added. Fill in the User Name field ensuring that it exactly matches the account name of the user you created (e.g. CloudPrintUser). In Resource Manager click PDAgents. On the right hand side, double click on the server. On the General Settings tab, in the Print job user authentication frame, tick the Allow Google Cloud Print authentication checkbox. Choose the user you created (e.g. CloudPrintUser) from the Cloud Print Service User drop-down box. Now right click on the server and choose Refresh. In Resource Manager, navigate to User Management > Users. Double click on a user. Click the Auth & Importing tab. In the Secondary Email Address text box, enter their Google Account email address (e.g. johnsmith@gmail.com). Note that in order to download the Google Cloud Print Service, you must use the Chrome browser. This must be installed on the print server before attempting the steps below. Note that it must be installed “for all users”. The first screen will ask for the user account credentials under which the service will run. If you created a local user then enter the user name like this hostname\CloudPrintUser. If the user was created as a domain user enter the user as domain\CloudPrintUser. Enter the user’s password and then click Register. Now it will open a Chrome browser window asking you to sign in. Enter the credentials as specified when creating the Google Account (e.g. acme@gmail.com) and sign in to Chrome (ensure Stay signed in is ticked). The next window will show you the local print queues. Select all of them (including Automatically register new printers I connect) and click Add printer(s). Now the printers on the print server have been registered to the admin Google Account, the next step is to “Share” them to the users. Open a web browser (doesn’t have to be Chrome) and ensure you are signed in to your Google Admin account. On the left, click the Printers link. 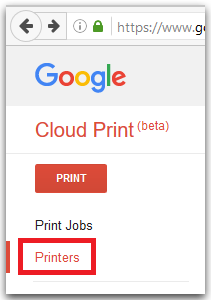 You should now see the list of printers you added after installing the Google Cloud Print Service. Select a printer to share. Enter the Google Account email addresses of the user(s) with whom you would like to share the printer. The user(s) will receive an email notifying them that a printer has been shared with them. They need to select Add Printer for it to be registered with their Google Account.